Minto was a planned village, designed and laid out by William Playfair for the 2nd Earl of Minto. 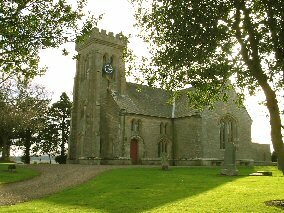 The Church – a Victorian building in the Gothic style – was built as part of the plan and was completed in 1831, replacing a much earlier mediaeval building which stood a short distance to the east and which was recorded as far back as 1275. An impressive war memorial, by Thomas Clapperton of Galashiels, stands behind the church. More information on this and many other war memorials and plaques found within the churches of the parish can be found on the Scottish War Memorials forum website. Visit this very interesting site, where visitors are encouraged to make contributions to the histories and details recorded.